1. Mystery shopping is not a “job,” it’s a way to make extra cash in most cases (though some who are really active and who live in high-shop areas, can make pretty good money). This means that any site offering you BIG MONEY is very likely a scam. Most sites will pay anywhere from $5 to $50 depending on the shop location and complexity. 2. Mystery shopping NEVER involves putting a check (not even one that looks like a bank check or cashier’s check) or money order (not even one that looks like a USPS money order) in your bank account and then wiring money to anyone. It is NOT real – even if they say you are supposed to collect details on MoneyGram, Western Union or any other wire transfer company. 3. You will, for some shops, have to make a payment out-of-pocket. For example, if you are doing a Dunkin’Donuts mystery shop, you may have to purchase a donut and/or a drink in order to give feedback on the quality of the service and the products. NO WORRIES though, legitimate companies will reimburse you with your payment for the shop. 4. Legitimate mystery shopping companies won’t charge you a fee to join them. 5. Some areas will have more shops than others. You’ll want to monitor the sites you register with to see what’s available in your area in order to get the most opportunities. 6. You have to be great at observing and remembering details! When you are doing a shop, you may have to notice and remember the name of the person who took care of you, whether a store was clean, whether employees greeted you and were wearing proper uniforms, etc. You’ll want to keep a pad in the car so you can make notes while your memory is fresh! 7. Be prepared to send solid details to the company. The more detailed and candid your input, the more likely you are to get more jobs in the future. 8. Assuming you register with a legitimate company, you’ll be asked to provide your social security number at some point. It’s OK. They need this in order to send you an earnings form at the end of the year. 9. Questions asked during the registration process are intended to help companies find the people who are the best fit for their shops. They’re not trying to steal your information. 10. Shops can be really diverse! Some will be in restaurants or stores, others will be in banks or health care providers offices, and others could be in entertainment locations (movies, amusement parks, attractions, etc.) or airports. Have fun with it! So, with all of that in mind, here are some legitimate mystery shopping companies to get you started as a Mystery Shopper! If you’d love to mystery shop WITHOUT LEAVING THE HOUSE, check out our post about Telephone Mystery Shopping companies. 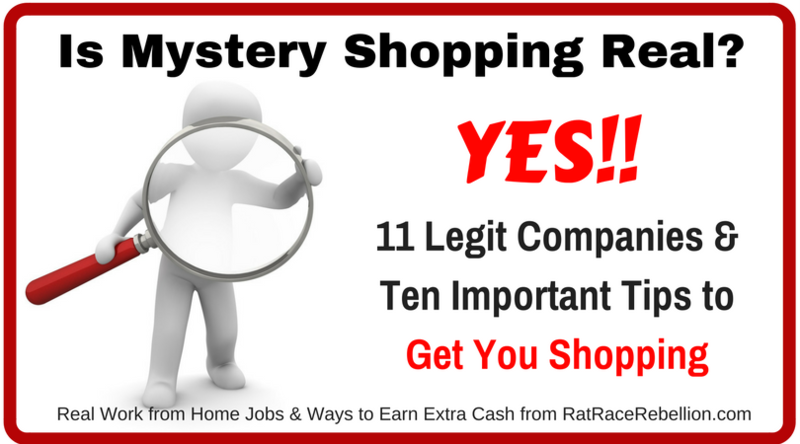 This entry was posted in Mystery Shopping, Work at Home Jobs and tagged mystery shopping. Bookmark the permalink.